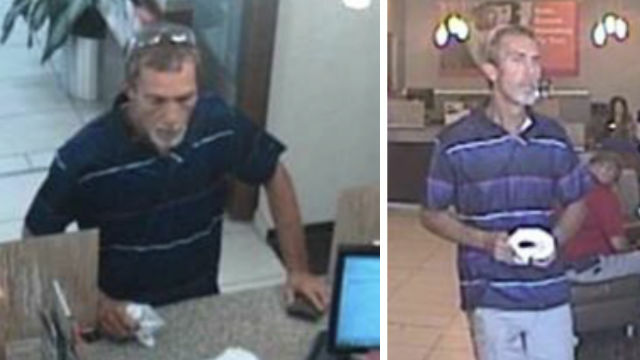 Surveillance photos of the bank robbery suspect released by the FBI. The FBI reached out to the public Friday for help in identifying a man who carried out two El Cajon bank robberies in recent weeks. The thief, believed to be 50 to 60 years old, handed threatening demand notes to tellers at a Mission Federal Credit Union office in the 700 block of North Johnson Avenue on the morning of Sept. 14 and at a Wells Fargo branch in the 2300 block of Jamacha Road on Tuesday afternoon, according to the federal agency. The written messages included statements about a weapon, though none was seen. The bandit was described as a thin, roughly 6-foot-tall white man, the FBI reported. Anyone with information about either case was asked to call San Diego County Crime Stoppers at (888) 580-8477. Tipsters may remain anonymous and could be eligible for a reward of up to $1,000.